• Events – This is a snapshot of upcoming events, ranging from business trips to team members time off. • Gemba walk tracker – we track the number of Gemba walks completed. We typically report on the area of business visited, who we worked with and the outcomes of the Gemba walk. • Meeting tracker – We use this tracker to record the meetings we facilitated or training sessions we conducted. We have a key on the bottom right showing how we measure the time and each box is color coded to match the team members names. • Monthly Calendar – This allows all team members to be aware of upcoming management and board meetings, so as to be better prepared if called in to provide status update on 1 of the critical projects. • Standard Work & One Point Lessons (OPL’s) – We use this area to track new Standard Work documents or One Point Lessons, by theme and by division. • A3’s – We use this area to track new Continuous Improvement (A3’s) submissions, A3 projects that were closed as well as newly identified CI opportunities while on Gemba walks. A running total allows us to monitor all of CI projects being supported, closed, or recently identified. 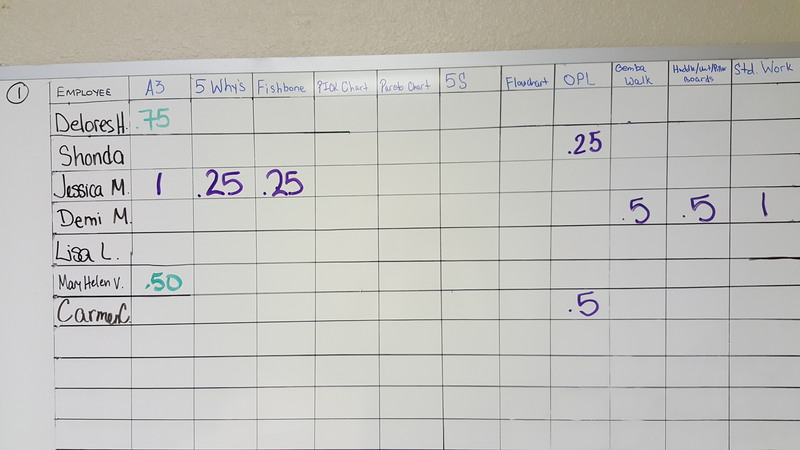 • Training Tracker – We use this area of the Huddle Board to track the time spent with individuals who are being coached on CI/Lean methodology. We measure the training in 15 minute increments (.25) and assess time allocations by CI tool, trainees, and B&PI team members. The B&PI huddles were implemented early on. They allowed the team to develop a strong bond, sped up the on-boarding process of new B&PI employees, helped identify and resolve issues quickly, and served as a model to other areas of the business, among many other benefits!